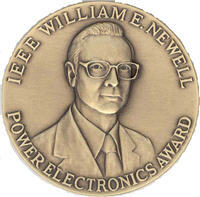 The IEEE William E. Newell Power Electronics Award was established in 2005. It was established in memory of William E. Newell of the Westinghouse Research and Development Center in Pittsburgh, Pennsylvania. This page was last edited on 22 April 2019, at 16:37.